The Bible says homosexuality is an unacceptable practice. Recently, however, many have claimed God’s commandments concerning homosexuality are outdated or misinterpreted. Those who condone homosexuality charge that conservative Christians have wrongly taught that a person cannot be a Christian and a homosexual. Who is right? Is it possible the writers of the Bible were homophobic and simply injected their own bias into God's Word? 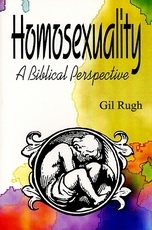 In Homosexuality: A Biblical Perspective, Gil Rugh considers the Old and New Testament views of homosexuality. He shows that all aspects of God’s Word, including His commandments concerning homosexuality, are eternal and unchanging. They have not been misinterpreted. Furthermore, Rugh shows, through God’s Word, the promise to everyone of eternal salvation and freedom from sin when trust is placed in the person and work of the Lord Jesus Christ.